Recommendations for TRH Brion and Anna’s first order polling are due on July 9, 2016. Recommendations to be considered for the 2nd polling of Brennan & Caoilfhionn will be accepted through the end of Friday 10/9. Recommendations for polling awards received after that time will be passed to our heirs. Please remember that you need not be a member of an order to recommend someone you consider deserving. If you know someone you feel strongly about, please recommend them via the online recommendations system. Their Highnesses, Brennan & Caoilfhionn, issued Their first round of Award Order Pollings on July 21, and responses are due back to Them by this Sunday, August 23. This is just a friendly reminder to complete and submit your replies! Their Majesties, Omega and Etheldreda, issued Their second round of Award Order Pollings on April 28, and responses are due back to Them by tomorrow, May 28. 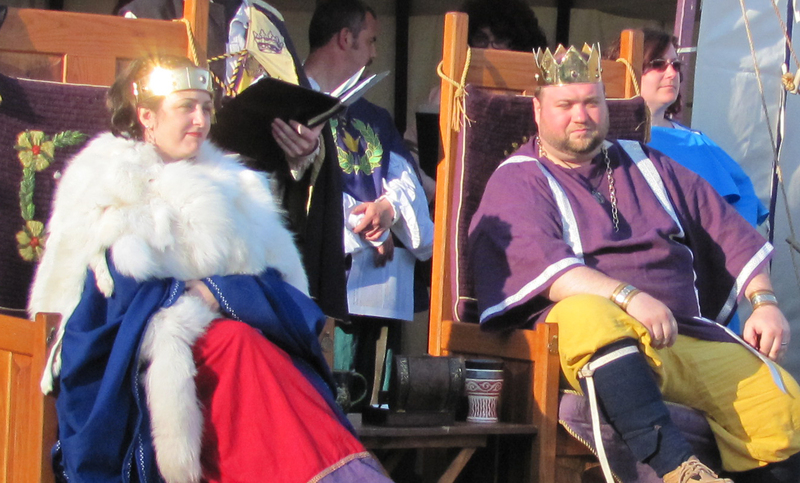 Their Highnesses, Omega & Etheldreda, have just distributed Their first Award Order Pollings today, and responses are due back to Them by March 14. And if you are subscribed to the polling distribution but did not receive the most recent polls, please contact the Clerk of the Polling Lists, (currently Duchess Katherine Stanhope). Their Majesties, Edward and Thyra, issued Their second round of Award Order Pollings on November 5, and responses are due back to Them by November 26. They rely on the advice of the Companions in making Their award decisions, and appreciate timely replies. If you are a member of a polled Order and are not subscribed to the polling distribution or the discussion list, you may sign up here: Polling Lists Please remember that each Order has two separate e-mail lists — one list is solely for sending out messages containing the links to the polls, the other list is for two-way discussion among the Companions of an order. If you are subscribed to a polling list but did not receive the most recent message containing the link to the poll, please contact the Clerk of the Polling Lists, (currently Duchess Katherine Stanhope). She usually sends a message even if there are NO candidates, so Companions know they have not missed a poll. The second polling of Edward III and Thyra II will be starting shortly. All recommendations for our 2nd polling are due by Saturday, October 25. Order members will be asked to respond to their 2nd polls by Saturday, Nov 22. Please remember that there are always new folks who need to be considered, and long-standing members who have been overlooked. Please take a look at the current Order of Precedence, as well: http://op.wiglaf.org/index.php. There is no deadline for non-polling recommendations. Saying thank you to the populace via the awards system is one of the most important roles of the royalty. We appreciate your assistance in finding those who deserve such recognition. Editor’s Note: Need more information about the East Kingdom awards polling process? This article gives a good overview. You do not need to be a member of an order to recommend someone for an order. Any person may recommend any other person for any award. Their Majesties, Brennan & Caoilfionn, issued Their second round of Award Order Pollings on April 25, and responses are due back to Them by May 19.